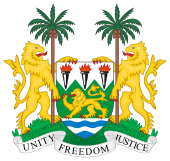 A referendum on a new constitution was held in Sierra Leone in August 1991. Voting was held over four days (23, 26, 28 and 30 August). The new constitution would restore multi-party politics, as the country had been a one-party state since the 1978 constitutional referendum. Of the approximately 2.5 million voters, turnout was around 75%. The new constitution was approved by around 80% of voters, and came into force on 1 October. As a result, the 1978 constitution was repealed, and fresh elections were held in 1996.